For info on topic just search for NtSetTimerResolution. All packages contain `Readme.txt' and exe-file. Packages of C# implementations also contain cs-file - C# source file which can be compiled to exe-file with C# compiler 'csc.exe' (located in .Net framework folders). Second version was implemented for gurus who would notice any process demonstrated weird behavior with maximum timer resolution. First version of service just sets maximum timer resolution upon its start. - set default timer resolution upon last instance of any of listed processes stop. In absence of ini-file second version does the same logic as first version. In presence of empty ini-file second version does nothing at all. in PowerShell as the fisrt step is mandatory, because PowerShell restricts script execution by default. Just place sript into folder with service`s exe-file. Start script either through context menu or in PowerShell. Script is capable to install (and re-install) all mentioned above versions of service. Script installs service with acount 'LocalSystem'. - Check folder-owner for an exe-file of service. - If exe-file is absent then check folder-owner for a cs-file of service (source file) and invoke C# compiler to build exe-file. - Check for a previous instance of STR service. - If STR service already installed then stop and uninstall it. - Install new instance of STR service and run it. Dear gurus, you can tweak source file of service yourself and rebuild exe-file of service with help of this script - just rename old exe-file. I put together a quick little script kiddie batch file to make things a little more simple. Obviously extract to where you put the exe. I put together a little set up that will install any of your versions (so even complete noobs can use your work- no need to know the file structure, download different versions, etc). I think I may have messed up something. "The Set Timer Resolution Service on this local computer started and then stopped. Some services start automatically if they are not in use by other programs"
- Which one version do you use? - Did service worked and then you performed any actions and it stopped work? Or it suddenly stopped work? - What OS do you have? There are no dependencies in this service. It only depends on .Net framework (or on C++ framework). (And I didn`t touch service`s source files for a many days). If service started mailfunctioning after you executed new installation script, then possible cullprit is account 'LocalService'. Is there log-file 'STR_Install.log'? And what events do you see in Event viewer? Another thought - second version of service in presence of non-empty ini-file depends on state of WMI subsystem. Edit: I was wrong about default account - it is namely "NT Authority\LocalSystem" (not "NT Authority\LocalService"). I was using the second version with no INI file. It was working fine, I messed with some services and clean up some reg crap, and on restart it started acting like that. I think it may be related to Von Dach's tweaks, but I opted for his tweaks that left WMI alone (because I know your service would probably need that untouched). And I use Windows 7 x64. Your log files only tell me that the service was correctly installed. That`s strange because both first version implementations do nothing except for NtSetTimerResolution call... Only difference between them is .Net platform. Did you look in event viewer? To simplify events searching you can clear event logs ('Application' & 'System') before service start attempt. Both can be used for a backup purpose. This is 4 more letters. Could that cause this problem in the first place? Also, is it important to point out that version 1 and 2 of C# run in x64, but the C++ version runs in x86? (identified by the *32 addendum in taskmanager). Edit: I inserted checks and interceptions into lines with event logging in both C# versions. You can redownload them packages from links in first post. And if my corrections do the job, then you can re-pack and re-upload your cumulative package. Yup, all fixed. Starts fine now. Thanks to you - that was a perfect suggestion about disabled event logs... Link in OP I replaced. Btw, I vote this for sticky. After script execution go to the 'Control Panel > Power Options > Change Plan Settings > Change Advanced Power Settings' and in dialog window you locate 'Processor power settings' tree root node - there live all unhidden settings. Not sure if should post in response here or the thread on the other section since you post everything in both places anyway lol. But I understand, traffic and all. Uh. Not sure why. But, rightclicking the file and selecting "Run with Powershell" makes a prompt show up, but then some red text shows up and it closes too fast for me to read it. I remember you saying how you need to make your ps1 scripts with work with a newer version of something another because Windows 7 is different by default? IDK. I just know it aint working. - saving error text to file after script execution. May be you already deleted 'Attributes' values under those regystry keys (or one key). Do you see mutliple settings in mentiond dialog under CPU settings tree node? Well, I added the cpu parking options a long time ago. Anyway, this is what I get. 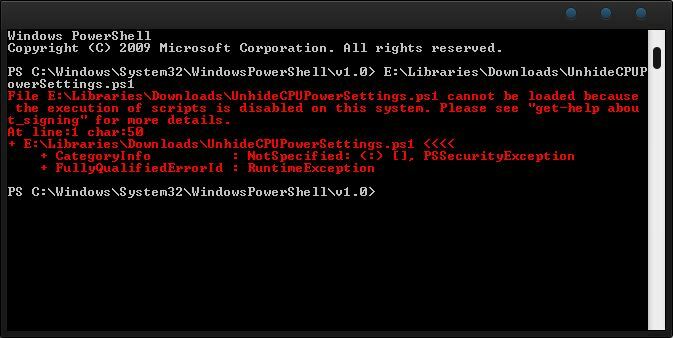 PowerShell by default restricts script execution. So user must set this policy to allow script execution. Ok, that worked wonderfully (setting it to Unrestricted that is). Sorry, never touched powershell before. So many options. So many. I am using PowerShell for 2 years now and I keep finding new things and aspects and tricks. I`m in love with this shell! It was created for IT professionals but thing is it can be used at any level of difficulty.